I haven't been able to find a case like this anywhere on the internet so far. A car was traveling in the left side of a one lane street and went to make a right turn into a plaza. When making the turn he hit a car to the right of him with his right fender hitting car B's driver's side front door. Driver A got out and said you are not allowed to pass on the right and especially this being a one lane street! Car B claimed that this street is 2 lane because cars always line up in two files up the road at the stop light. Up ahead about 100 meters is a light where a car can turn left or right but cannot go straight. Who is at fault here? Car A should have been paying attention that no one is going to squeeze in between him and the curb (wide lane where cars can park on the side but no cars were there) Or car B is at fault for trying to pass on the right of a one lane street, cutting off the guy in front and speeding ahead of him thus creating a dangerous situation? Or are both at fault in this case? Re: Passing on the right on a one lane street! If it's two marked lanes then Driver A will be at fault. Regardless of anything else it is the person who changes lane's responsibility to make sure the path is clear. It is a single lane. The lane is large enough for a second car to fit in on the right when the first car is all the way to the left. The markings are one lane going in opposite directions separated by a yellow line in between. Your description of street is very confusing to me. At first I thought you said it was one way, but now you are saying there is a yellow line seperating the directions. So the car traveling in the left lane was on the wrong side of the street? Yes, sorry, I read it as one way as well. jsherk wrote: Your description of street is very confusing to me. At first I thought you said it was one way, but now you are saying there is a yellow line seperating the directions. So the car traveling in the left lane was on the wrong side of the street? One lane going in each direction, not one way street. He/she is saying the lane is wide enough to fit a second car side by side in the same direction but is not marked as 2 separate lanes. The lanes are wide because there are stretches where the right side is marked for parking. My guess is the yellow vehicle that turned into the green vehicle be at fault as the green vehicle was not passing until the yellow one slowed downed and turned. The green vehicle could argue they were going same speed as yellow and not passing and the yellow vehicle just suddenly slowed down and turned into green. but what's the yellow vehicle doing on the wrong side of the road ? yes, the diagram is right on! the green vehicle cut off the yellow vehicle, had no right to squeeze in on the right like that but the yellow still had to check the blind spot. 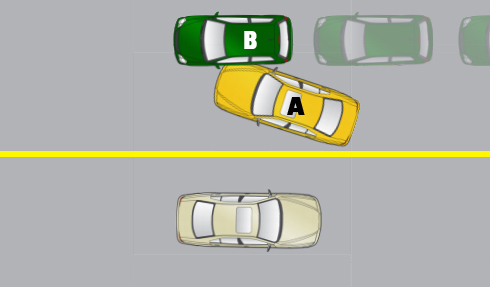 question is since yellow had his right turn signal turned on then isn't the green car at fault? Noahide Laws wrote: yes, the diagram is right on! Just because a vehicle has it's turn signal on, doesn't mean it has the right of way (except for busses, gotta yield for them). If that's the case, I can cross all lanes of the 401 at 40, and if I hit, I wouldn't be at fault because I had my signal on. As for this specific situation, because it was a single lane road, legally, the green car could not overtake, let alone overtake on the right. So personally, I would believe the green car is at fault. But what about the fact that since car A's fender (on the right corner ) hit car B's driver's door. Does not that show that B was too far up to be at fault? Meaning if it was A's door and B's fender that would show that B was cutting A off? #1 - The police officers opinion on who to charge. #2 - The insurance company's opinion on who is at fault. They are independent decisions of each other, meaning (as an example only) the officer may decide to only charge vehicle B with improper passing, but the insurance company may decide to put 100% fault on vehicle A. Sorry. Ignore all my previous comments. I was completely reading this wrong. Personally I would place blame on vehicle B. Without marked lanes this is a one lane road. I suspect, however, that the insurance company will split the blame. I won't regurgitate the sections. I figure most of you can navigate the HTA.